Bring this Safavieh Courtyard area rug into your dining room for an easy splash of style. Modernly designed with you in mind, this plush synthetic indoor/outdoor rug will be a great addition to your home. This machine-made rug makes long-term decorating easy. Quality interior design comes in the form of this floral plants patterned black rug. A bold, vibrant palette of colour is the signature of this weather-resistant, Indoor/Outdoor collection. The Promise collection combines the benefits of outdoor functionality with the pizzazz of contemporary fashion. The contrast of earthy neutral colours with exciting, brilliant accent colours create an exciting new element to your dicor that brings any space to life. Paisley Multi is a gorgeous paisley design accented with bright and vibrant colours. It will create a classic look while bringing colour and style into your home. It is the perfect rug to be a staple piece in your decor. 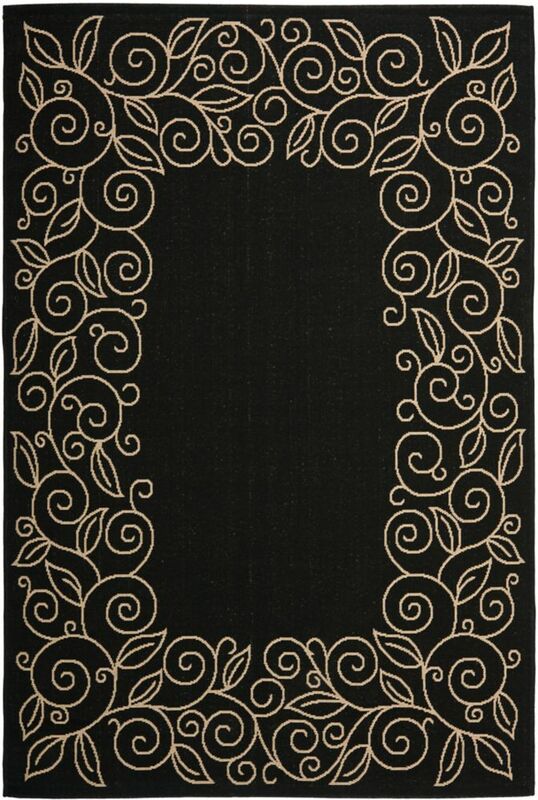 Courtyard Zak Black / Beige 5 ft. 3 inch x 7 ft. 7 inch Indoor/Outdoor Area Rug Bring this Safavieh Courtyard area rug into your dining room for an easy splash of style. Modernly designed with you in mind, this plush synthetic indoor/outdoor rug will be a great addition to your home. This machine-made rug makes long-term decorating easy. Quality interior design comes in the form of this floral plants patterned black rug.